It was last seen on the market 67 years ago, since when prices for one of Ireland's most beloved artists have taken a significant leap forward. 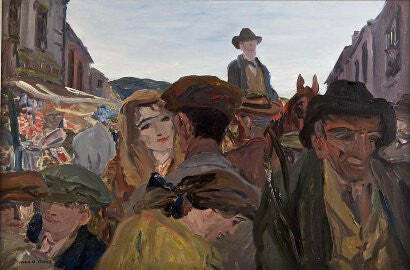 Jack B Yeats' 1925 oil work A Fair Day, Mayo has a high-end estimate of $1m ahead of its sale at Adam's Fine Art Auctioneers' Irish art auction in Dublin on September 28. "The picture was sold through Leo Smith in Dublin in October 1944 for the then huge price of £250 to Mr JP Reihill Senior," Adam's managing director, James O'Halloran, told the Irish Independent newspaper. "The painting has been in the Reihill family ever since." The depiction of a busy country market town is notable for its street level perspective and claustrophobic nature. Before it came to reside with the Reihill family the painting had already enjoyed a notable existence, which could well boost its price at the auction block. Yeats donated the painting to Eamon de Valera, the first leader of the Fianna Fail political party, who hung it on his office wall. The market has been strong for Yeats in recent years but this work could well beat past results. Age, an oil work depiction of a horse, achieved £663,500 at a Sotheby's sale in 2001, comfortably above its £500,000 high end estimate. Drift, an oil on canvas produced in 1941, sold at Whyte's in Dublin for $953,000 in 2006. The sale will also feature Yeats's haunting 1946 painting The Dawn, which has a top end estimate of $163,000. Works by Colin Middleton, Charles Lamb and Louis Le Brocquy round out the auction. Paul Fraser Collectibles will bring you results from the sale later in the month.